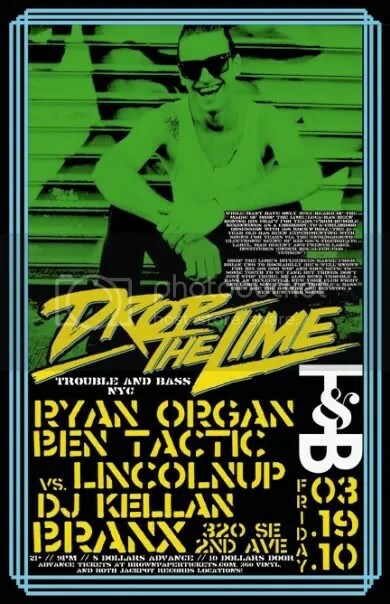 Join us for Drop The Lime (Trouble & Bass, NYC) @ Branx Friday March 19, 2010 with support from Ryan Organ (Various, PDX), Ben Tactic vs. Lincolnup (Bubblin’, PDX), and DJ Kellan (PDX). Let’s Bass Cave Rave Y’all! This entry was posted on March 9, 2010 at 2:01 am and is filed under Ben Tactic, Bubblin, Drop the Lime, Lincolnup, Ryan Organ, Showtime!. You can follow any responses to this entry through the RSS 2.0 feed. You can leave a response, or trackback from your own site.